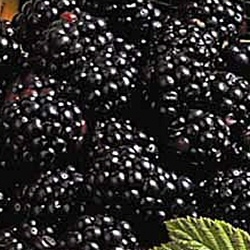 Oregon Thornless is a mid to late season blackberry variety and produces delicious blackberries. Being thornless, it is free of the thorns that have in the past made blackberry picking a challenge. Blackberries are great for eating with cream, making blackberry pies or simply eating fresh from the bush. This variety of blackberry has decorative leaves with good autumn colour.